Leading Manufacturer of copper wire lug connection, flexible bus bar (braided of braided) connector and copper flexible connector from Surat. 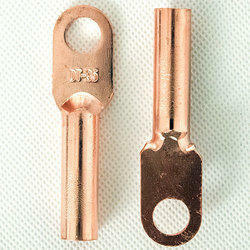 Our clients can avail from us an unparalleled Copper Wire Lug Connection. These products are developed using supreme quality required basic material and modern machinery in line with the defined quality parameters of the industry. Furthermore, to meet emerging demands of the clients, we have made the offered gamut available in different sizes and specifications. It can be customized from any size from 75 mm to 600 mm or up to 3000 sq.mm. 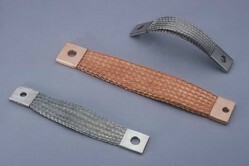 Our clients can avail from us qualitative Copper Flexible Connector. Appreciated for their longer service life, efficiency and performance, these offered connectors are in compliance with the defined quality parameters of the industry. Furthermore, our valued clients can avail the offered connectors in both customized and standard forms. Packaging Details: poly bags in standard wooden boxes/Corrugated boxes loaded on pallets for export or domestic standard packing. Can be Customised.